Electronic color separation and screening process refers to the use of electronic color separation machines to divide color image manuscripts into single-color (yellow, magenta, cyan, and black) dots or dots by means of electronic scanning color separation and electronic screening. Figure and output film process. The electronic color separation machine is a sophisticated image processing device that integrates optics, machinery, electronics, and computers. By the scanning unit (input part), control unit (calculation part), recording unit (output part) composed of three major parts. As shown in Figure 3-23. The scanning head is used to perform spot scanning sampling of the manuscript, and the density level of the manuscript is converted into the intensity of the light. After photoelectric transfer, the optical signal of the manuscript image information is converted into an electric signal. The computer is used to perform various processing on the images of the converted electrical signals to meet the printing requirements. After processing, electronic image signals suitable for printing requirements are converted into photoelectric image signals, and recorded on the photosensitive film by means of a recording head and an amount of exposure. The reproducibility of color image prints is an important indicator for evaluating prints and must be carefully managed. The electronic color separation machine is equipped with adjustment knobs, and the emphasis on each level of the manuscript is achieved through the main level circuit and the auxiliary level circuit, including: highlighting of the extreme highlights, highlighting of the highlights, emphasis of the intermediate tone and shadow tone, and obtaining the most prints Good tone reproducibility. Color image manuscripts can produce various color errors during the copying process. For example, the ink should completely reflect the primary light and absorb the complementary light to achieve a 100% color rendering efficiency. However, in practice, the yellow ink has a color rendering efficiency of about 91%, and the magenta ink and the cyan ink have a color rendering efficiency of about 60 to 70%. In addition, color filters, sensitized films, and papers cause color shift. Therefore, In the processing of color images, color correction must be performed. In the direct color separation and screening process, a mask is used to make color correction. In the electronic color separation machine, a color correction is performed by a computer using a mask circuit. Easy to operate, the effect of color correction far exceeds the mask. According to the principle of subtracting color from ink, yellow, magenta, and blue primary inks are superimposed together and should be black (or neutral gray). However, in actual printing, due to the presence of color errors, solid printing with yellow, magenta, and cyan inks cannot obtain sufficient blackness. Therefore, in order to increase the density of the dark part, it is necessary to compensate with a black plate. If the yellow, magenta, and cyan inks are overlaid into gray portions and black ink is used instead, color inks can be saved, overprint quality can be improved, and the level reproduction effect can be increased. This process is called under color removal. 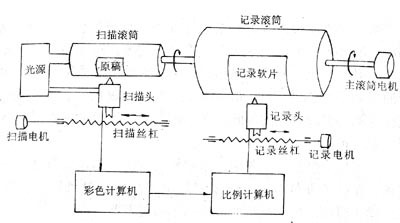 The electronic color separation machine is provided with a black version of the synthesis circuit, which decomposes the neutral gray of the dark part of the original document as a black version signal. At the same time, the black version of the signal is processed and used as yellow, magenta and cyan color removal signals to reduce the color of the yellow, magenta, and dark shades, thereby increasing the color reproduction of the dark tone. The electronic color separation machine is provided with a virtual light mask circuit to emphasize the subtle levels and improve the clarity of prints. Level correction, color correction, black edition selection and background removal, subtle levels of emphasis, etc. are all done by the color computer of the electronic color separation machine.